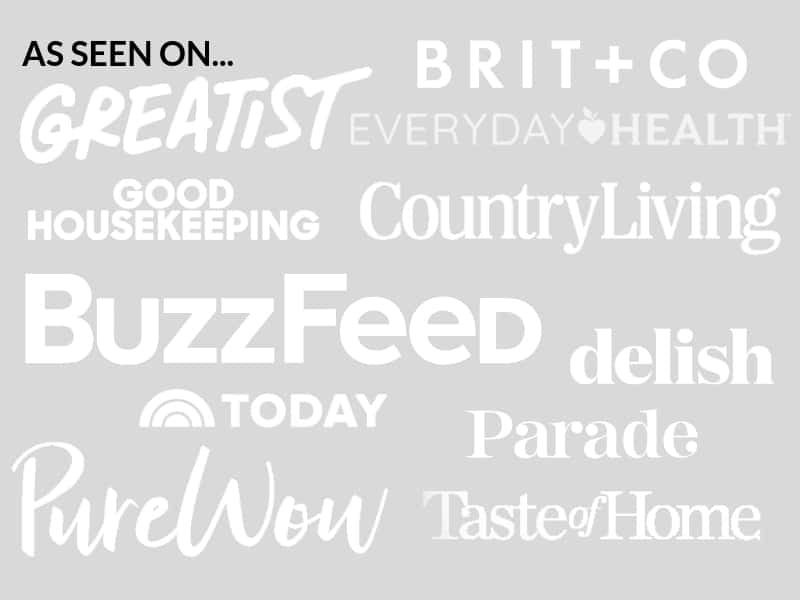 February 6, 2018 By Elizabeth Lindemann Leave a Comment / This post may contain affiliate links. 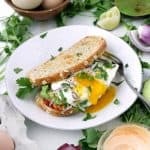 This is my absolute FAVORITE vegetarian breakfast sandwich. Ever. It has Sriracha mayonnaise. It has mashed avocado. And it has the most perfect sunny-side up egg with a runny yolk. Topped with some fresh cilantro, a little bit of lime juice, some red onion, and salt/pepper, it’s bursting with delicious flavor and hearty nutrients that will get you going for the day! There are some perks to being a food blogger. Sometimes you get free stuff, which is great, and the BEST is when friends with chickens unload their gorgeous farm fresh eggs onto you. I knew I had to do something extra special with these colorful beauties, starting with these vegetarian breakfast sandwiches. What should I make next? Quiche? Shakshuka? All of the above?? Oh man, I am way too excited about these eggs. Please share what you think I should make in the comments! Sunny-side-up is my favorite way to eat eggs. With a perfectly round runny yolk and buttery, somewhat crispy edges to the whites, it’s perfect for this sandwich. But it’s messy. You’re going to want a napkin (or five) for this one. I make my sunny-side-up eggs in a nonstick skillet in butter. First, I melt the butter over medium-high heat. Then, I crack the egg carefully (!) directly into the skillet, being careful not to damage the yolk. I turn the heat down, cover the pan, and wait for the whites to set for about 2 minutes. Covering is key here- it traps the heat in and ensures the white top of the egg cooks in a shorter amount of time, so the underside and yolk don’t get overcooked. Don’t like a runny egg yolk? No judgement here. I suggest purposefully breaking the yolk when you add it to the pan, or cooking it a bit longer, until it’s the desired doneness. There’s one more trick to making this sandwich absolutely perfect, and it has to do with the avocado. Whenever I slice avocado and add it to a sandwich or burger, it looks pretty, but it always squishes out the sides when I take a bite. Instead of slicing the avocado for this recipe, I mashed it into the bread slice with a fork. This makes it stick a bit better and ensures you get some in every bite. Make sure you season that avocado with plenty of salt and a squeeze of lime juice! If you like this, try these vegetarian baked eggs with marinara, potatoes, and spinach. 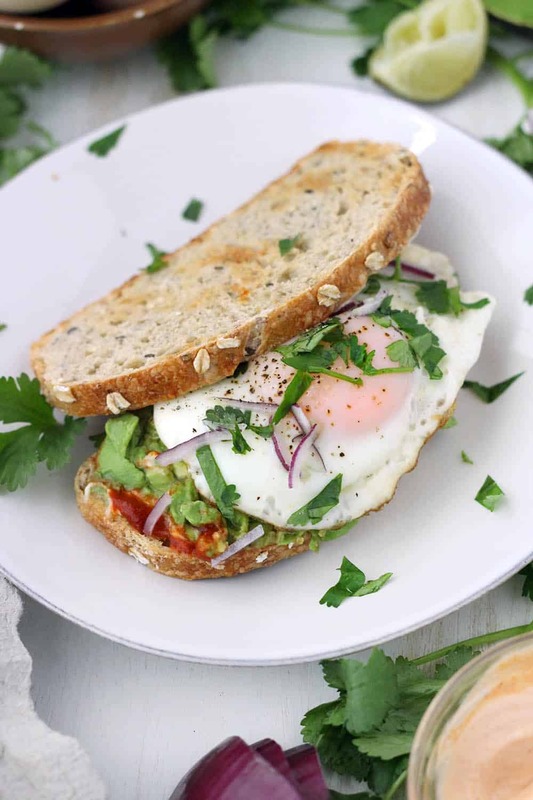 Here’s the recipe for the BEST vegetarian breakfast sandwich EVER. Hope you like it as much as I do! 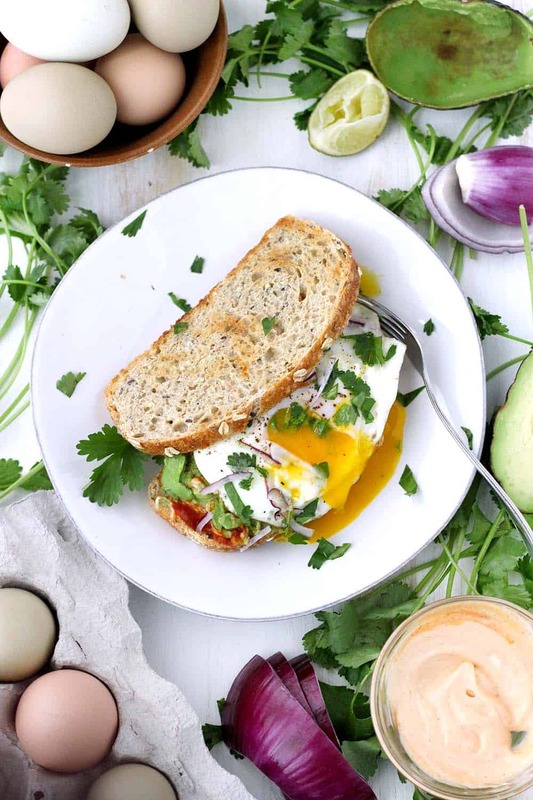 This Vegetarian Breakfast Sandwich Recipe is my absolute favorite. 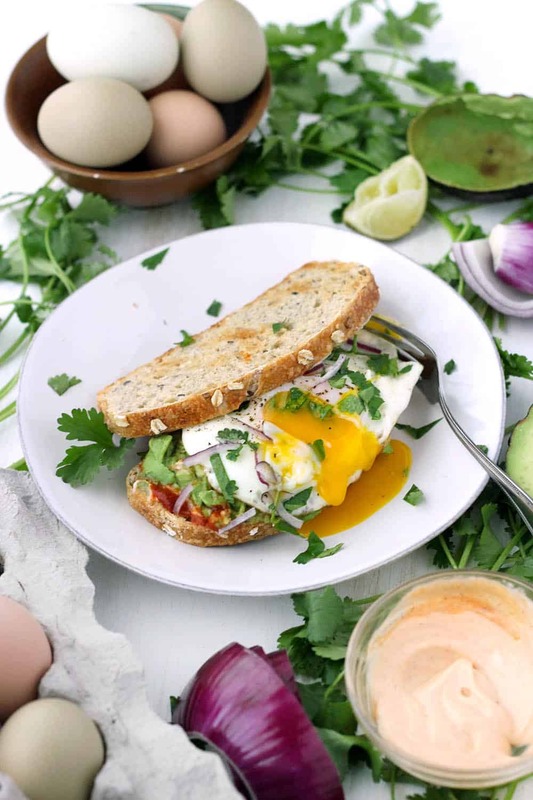 Features smashed avocado, Sriracha mayo, and a perfect sunny-side-up egg, with a little lime juice, cilantro, and red onion for extra flavor. It's easy to make for a hearty weekend breakfast or brunch! In a small bowl, mix the mayonnaise and Sriracha together. Set aside. Melt the butter in a nonstick skillet over medium-high heat. Crack the egg carefully into the pan so the yolk doesn't break (see notes). Turn the heat to medium-low and cover the skillet, cooking the egg for about 2 minutes, or until whites are set and yolk is done to the desired consistency. Meanwhile, spread the Sriracha mayo mixture on the two slices of bread. Using a spoon, scoop the avocado from the peel and add to one slice of bread. Use a fork to mash the avocado evenly onto the bread. Squeeze the lime juice on top of the avocado and top with salt. Place the egg on top of the avocado. Sprinkle the cilantro and red onion on top of the egg. Season with salt and pepper. Place the other piece of bread on top of the assembled sandwich. Eat! With a napkin- it gets messy. This recipe yields ONE sandwich. Double it for two, quadruple it for four, etc. Don't be too concerned about the measured amount of ingredients for this recipe- it's just a sandwich. Add as much mayo, Sriracha, or cilantro as you want! Don't like a runny yolk? Break the yolk as you fry it, and cook until solid if you prefer.